The Mitchell 1 ProDemand development team is constantly working to enhance the auto repair information software with new features to help auto repair professionals work at maximum efficiency. We know that when the vehicle is in the bay, technicians don’t have a lot of time to spend on a computer searching for information. They must have instant access to the critical information needed to complete the diagnosis and repair as accurately and quickly as possible. In other words, ProDemand must deliver. It’s always rewarding when a user lets us know the software is doing its job for them. Recently one of our power users of ProDemand was asked by PTEN Magazine to review the software. Stefanie Von Rueden, a writer for PTEN, interviewed Lee Standiford, owner of DriveTec Automotive in Loveland CO, and his comments about ProDemand were published on the Vehicle Service Pros website. 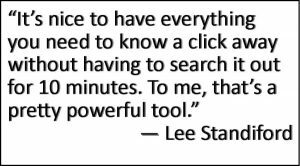 We sure appreciate Lee’s taking the time to share his feedback with PTEN‘s readers. And now we’d like to share it with you, too! For a general repair shop, a diagnostic reference that offers OEM-level coverage for all makes and models is a must-have. Lee Standiford of DriveTec Automotive appreciated the comprehensive coverage that Mitchell 1 ProDemand offers. Standiford has been in the industry for 38 years, and has used a lot of different programs, he says. When he first made the switch to ProDemand, he found that there was a bit of a learning curve involved with learning the different program and how to use each feature. But, he confirms that there is plenty of online help and customer support to assist with that transition, and once he understood the format, he found the program intuitive and easy to use. For Standiford, standout features include the wiring diagrams, (which Standiford uses to highlight and target circuits), information lookup by plate or VIN and SureTrack Real Fix information. For example, Standiford says, when a vehicle comes in with a check engine light on, they are able to pull the code and use ProDemand to determine what the most probable causes are for that particular make, model and year. So, if the code is triggered by a sensor, and the SureTrack Real Fix information shows a probable cause for that issue, it saves techs the diagnostic time for determining whether the sensor is faulty, or the code is actually a symptom of a larger underlying cause. This saves time because it allows technicians to test for the most probable real-world cause of the problem first, instead of following the standard diagnostic process. Standiford says that he hasn’t found anything about this tool that he dislikes. He has no suggestions for improvement, and finds that it functions well. “Just for ease of use and adding the component test features and just having everything pop up immediately, it just overall is a very handy product,” he says. He also appreciates that the tool is constantly being improved and updated so that it stays current for every vehicle he uses it on. “In this industry, information is our most powerful tool. And so, from my standpoint, I think this is the best product I’ve ever used,” Standiford concludes. Jill Schafer is the Marketing Communication Manager at Mitchell 1 and has over 20 years of marketing experience with high-technology organizations, including over 10 years in the automotive information industry.